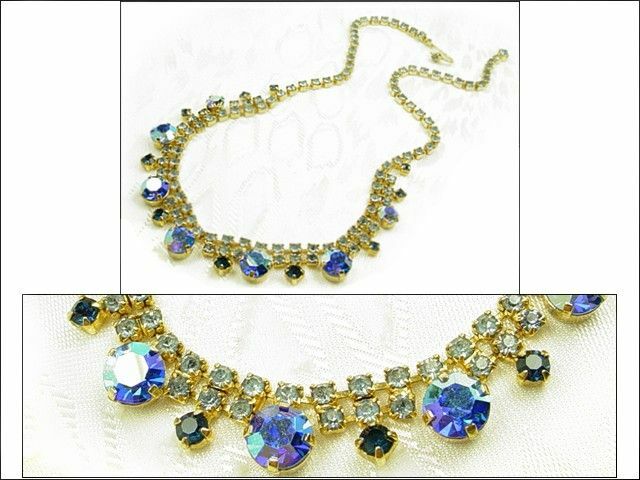 Add a bit of attitude with a vintage necklace. 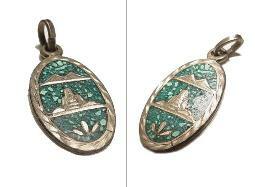 Suffragette Victorian Revival Necklace. 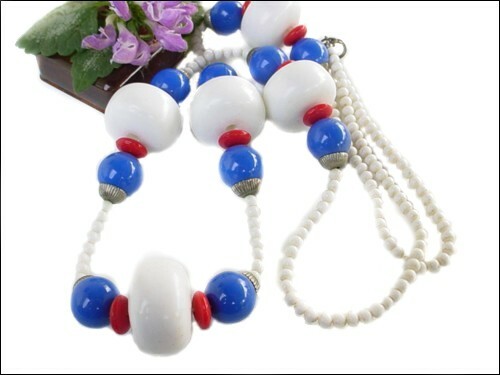 long thermoset necklace will certainly make a stupendous statement. necklace was vintage when I purchase it many years ago, and it came with the box clasp. 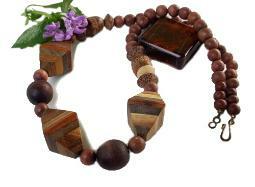 Unsigned necklace. 1/2" x 7/8". Closes with a J clasp and a figural 8 shape connector at the other end. 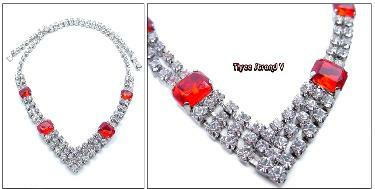 Necklace - 24" in length. small age fracture but does not distract from its beauty. Necklace pendant is a treasure. Silvertone, 3/4" rectangular links connects to box links, ends with a J hook closure. 17" from tip to tip. blue, and light blue. 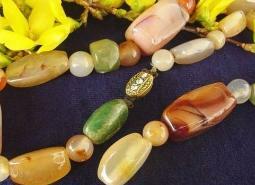 15 3/4" length includes the hook clasp. Signed on the clasp. up to 17" with a hook style closure. 1/4" x 1/2", great quality heavily made. Add a fold over necklace extension for added length. and leaves. Est. 1970-80s. 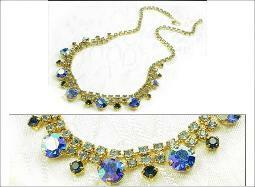 Necklace - 16 1/2"L.
topped with 3 rs. 16"L x 3/4"W.
Colors of purple white and green. 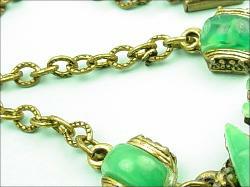 Jadelike green stones are a vintage lucite and the sections are a graceful slender 1", set in an ornate jeweled dimensional frame. Richly textured golden setting. Box catch looks hand cut, closes tightly. 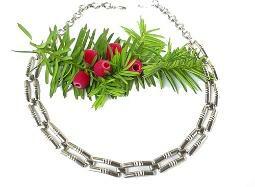 Necklace - 15 1/2" long. 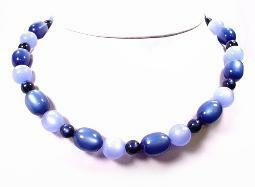 Elongated Czech centerpiece accents this vintage necklace with a silvertone caped blue glass pendent. 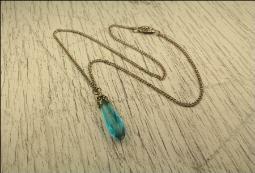 Pendent 1 1/8". 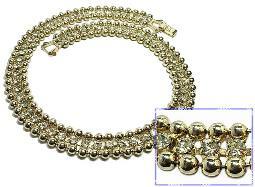 Necklace chain - 16" length. 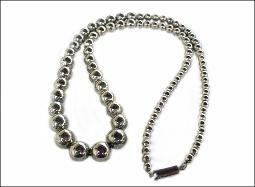 Closes with a snap clasp bail. 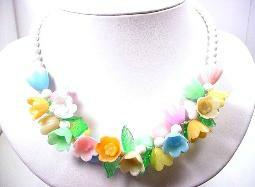 Enjoy a necklace that looks like it bloomed in the summer. 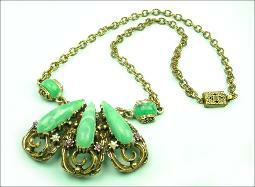 Vintage costume jewelry.